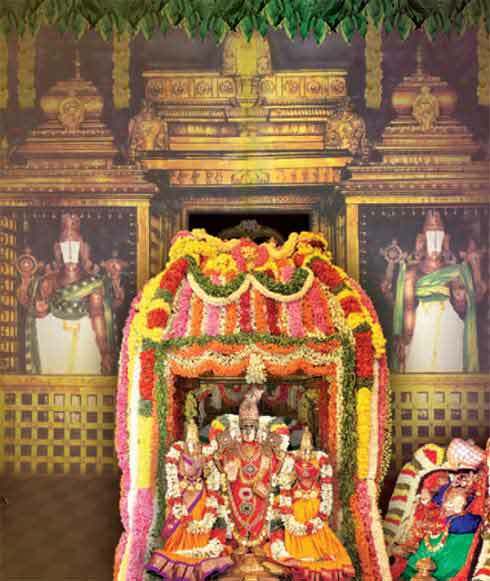 The annual Ugadi Asthanam will be conducted in Tirupati Sri Srivari Temple, Tirumala on April 6, 2019. Ugadi, Telugu and Kannada New Year, is on April 6. On the Ugadi day, Lord Malayappa Swami along with his consorts Sridevi and Bhudevi will be magnificently decorated on Ugadi morning in Sarva Bhoopala Vahanam in front of Bangaru Vakili. Lord Vishwaksena will be also present during the occasion. Laddus, Vadas, Appams, Dosas and Anna Prasadam are offered as Nivedana. Later clothes are offered. The recital of the New Year Panchangam will be done in front of the Lord. Tithi, Vaara, Nakshatra will be recited along with income and expenditure. Predictions regarding floods, drought and yields will also be made. Predictions based on the birth stars of Lord Malayappa Swami, Bhudevi and Sridevi will also be made. Lord Venkateswara who is also known as Nithya Kalyana Chakravarthi will be worshiped for the peace and prosperity of entire world. Public are not permitted for this Ugadi puja which takes place at the Ghanta Mandapam situated in front of Bangaru Vakili.